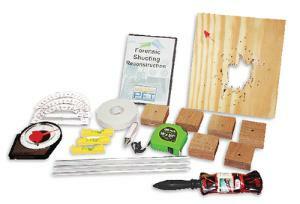 This kit combines hands-on forensic applications with mathematical calculations to reconstruct shooting scenes for crime scene investigation. Using realistic shotgun shot pattern samples, students will calculate the angle of the shot, and then determine the shot distance using supplemental patterns included on CD-ROM. Kit includes teacher notes with three lab exercises and test bank, and a PowerPoint presentation to assist instructors with presenting lessons in Shooting Reconstruction Identification and Lab Techniques. Other topics covered in the PowerPoint lecture and exercises include; angle calculation, angle measurement, distance determination based on angles, and glass fracture patterns. Kit contents includes: Six different angled trajectory blocks w/mounting tape, three aluminum trajectory rods, three levels, three zero-edge protractors, shotgun shot patterns, angle-finder, string, a plumb bob, and tape measure. Materials provided for 15 students, working in groups of three.